If you don't know what dulce de leche is, you need to find out... now. 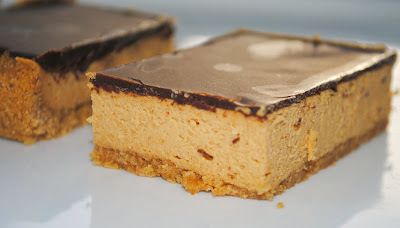 Its a dark, thick, creamy, caramel-y sauce made from sweetened condensed milk that takes these cheesecake bars from good to oh.my.god.good. 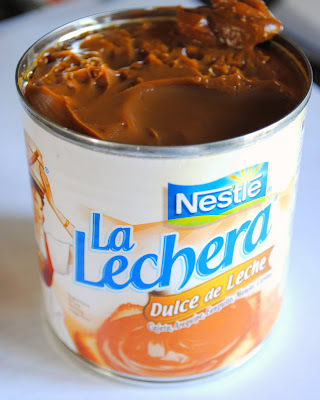 There are methods for making dulce de leche yourself; I've tried it before without success. I've heard about boiling, baking, and even crockpot methods, but it's much easier to do the "buy it in the grocery store" method. You might not be able to find it at every grocery store but most large stores carry it. Try either the baking aisle or the Mexican/International foods aisle (this is where it is at my store) and it comes in a small can like sweetened condensed milk. Make sure it actually says dulce de leche as I've seen the same brand of sweetened condensed milk in the baking aisle but it was just the ordinary stuff. These cheesecake bars have a classic graham cracker crust, the dulce de leche filling and are topped with a chocolate glaze. They work perfectly baked in a 9x13 pan, a jellyroll or regular baking pan both work well. 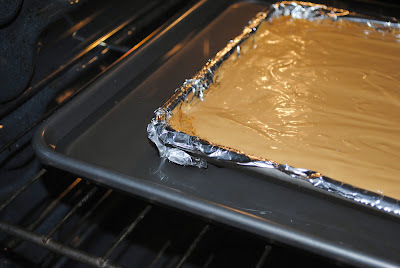 Make sure you also have a larger pan to put the 9x13 pan inside of so you can bake the cheesecake in a water bath. Baking the bars in a water bath prevents the cheesecake from cracking. Also make sure not to skip lining the pan with foil. 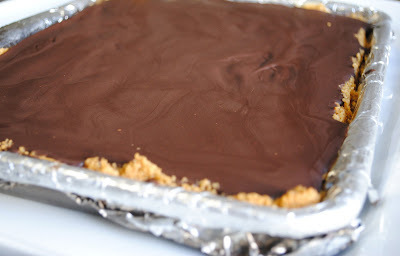 This helps with almost any bar cookie; just lift out the whole pan of bars using the foil and it is so much easier to cut and serve. Preheat oven to 325 degrees. Line a 9x13 pan with aluminum foil, making sure there is at least an inch overhang on all sides, preferably a couple on both ends. 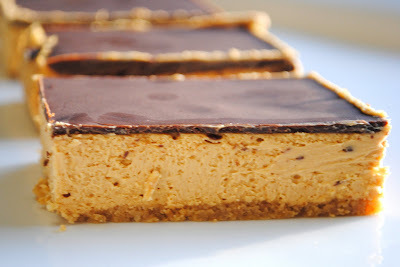 In a food processor, process graham crackers to fine crumbs, add sugar and pulse several times to combine. With processor running, add melted butter and process for about 15-30 seconds more. Press crumbs onto the pan in an even layer. Bake for about 10 minutes and cool in pan on a wire rack. Beat softened cream cheese with mixer on medium-high speed for 2-3 minutes until smooth. Add in the eggs, one at a time, beating and scraping the bowl after each egg. Add the milk and salt and beat on low until smooth. Add the dulce de leche and beat on low speed until smooth. Pour over the crust and smooth with a rubber spatula. Set pan inside a larger pan and add hot water to the larger pan until water is about half way up the sides of the cheesecake pan. Bake for about 35-40 minutes until filling is just set. Cool on wire rack for about 2 hours and then cover and refrigerate for at least 6 hours more. In a large measuring cup, add chocolate pieces, butter and corn syrup. Microwave on low powder for about 1 1/2 minutes, stirring every 20-30 seconds until almost melted. Stir until smooth. 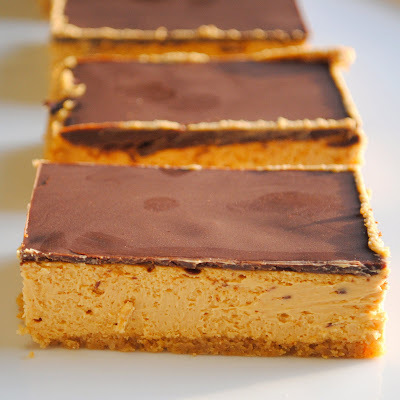 Pour glaze over chilled cheesecake, tilt the pan or use an offset spatula to smooth the chocolate up to all the edges. Chill at least 30 minutes more. Use excess foil to remove the bars from the pan, peel foil off the back, and transfer to a cutting board. Using a large sharp knife, cut into squares and serve. Oh those bars are mouth-watering! Wow-these look absolutely amazing. I think the hubby would love it if I made them! Oh my god!! These are sinful looking but still so divine!! I made these for a baby shower and all I can say is WOW!! These were PHENOMENAL! Thank you so much for sharing such an awesome recipe! @Kitchen Slave -- so glad you liked them! !